What is the Distance Formula? The distance between to given points is calculated by using a distance formula. 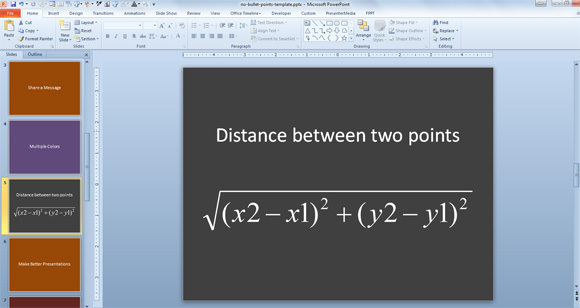 The distance formula can be helpful if you need to find the distance between to points on the coordinate. If you need to find the distance between the points on the coordinate system given by ( 1, -4 ) and ( -4, 2 ), then you can apply the distance formula as follows. Another good example is to measure the length of a line using the distance formula. Here we will apply the formula to get the length of a line segment AB where the point A is at ( 0, 2 ) and point B is at ( -1, – 4 ). Posted on October 28, 2013 October 28, 2013 Tags distance, Distance Formula, Euclidean Distance, Examples, formulaLeave a comment on What is the Distance Formula? You can calculate the shortest distance between two points using the formula above. Basically this will allow you to get the distance between x and y. There are some online tools that help you to identify what are the shortest distance between two given points.